We heard him in his European debut on May 4 at Teatro Massimo in a very highly acclaimed concert in the Sala degli Stemmi where he presented a program that included music of Martin Kennedy (a young English pianist and composer), Liszt, Prokofiev, and Mendelssohn-Bartholdy. It was program correspondent with others he has chosen to perform wherein the most well-known pieces of the great romantic and late-romantic repertoire are coupled with new works by contemporary composers. 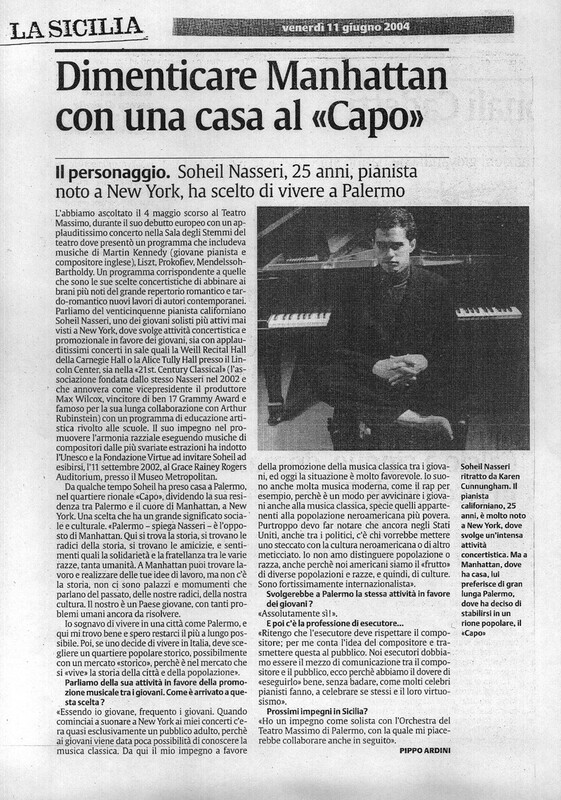 We are talking about the 25-year-old Californian pianist Soheil Nasseri, one of the most productive young soloists ever seen in New York, where he is busy with concerts as well as promotion in support of young people– both with very highly acclaimed concerts in halls like Weill Recital Hall at Carnegie Hall and Alice Tully Hall at Lincoln Center, as well as with ‘21st Century Classical’ (the association founded by Nasseri in 2002 and which counts as Vice President the producer Max Wilcox, the winner of no less than 17 Grammy Awards and famous for his long collaboration with Arthur Rubinstein) with an artistic education program that centers around public schools. His work promoting racial harmony by performing music of composers from many varied backgrounds led UNESCO and the Virtue Foundation to invite Soheil to perform on September 11, 2002 at the Grace Rainey Rogers Auditorium of the Metropolitan Museum of Art. For some time Soheil has made Palermo his home, in the local neighborhood “Capo”, dividing his residences between Palermo and the heart of Manhattan in New York. It is a choice that has great social and cultural significance. “Palermo,” explains Nasseri, “is the opposite of Manhattan. Here one finds history and the roots of history. In Manhattan you can find work and realize significant plans and ideas, but there isn’t the kind of history that there is here, there aren’t historic buildings and monuments that can compare with those here in Palermo. We are a young country and still have a lot of problems to solve. Let’s talk about your music education activities benefiting young people. How did you arrive at this choice? “Being myself young, I frequent young people. When I started to perform in New York there were audiences which consisted of only adults, because young people don’t have many opportunities to get to know classical music. That’s what started my program to promote classical music among young people, and today, at my concerts, the situation is much better. I also play a lot of modern music, like rap for example, as it’s a good way to introduce young people to classical music, especially for those who are devoted to the rap genre and lifestyle. Unfortunately, I can’t help but notice that in the United States, also among the politicians, there are some who would like to put a wall around certain segments of the population. I don’t like to distinguish groups of people and races from each other, particularly because we Americans are the fruit of many diverse populations, races, and cultures. I am fiercely international. Will you carry out the same program for young people here in Palermo? Picture caption: Soheil Nasseri, in a portrait by Karen Cunningham. The Californian pianist is very well-known in New York, where he carries out an intense concert schedule. But instead of remaining in New York where he has a home, he prefers to come for extended amounts of time to Palermo, where he has chosen to live in a popular local neighborhood, the “Capo”.